Mark Steyn was born in Toronto. He was baptized a Catholic and later confirmed in the Anglican Church. Steyn’s great-aunt was artist Stella Steyn. He was educated at the King Edward’s School, Birmingham, in the United Kingdom. He left school in 1978 at 18 and worked as a disc-jockey before becoming musical theatre critic at the newly established The Independent in 1986. He was appointed film critic for The Spectator in 1992. 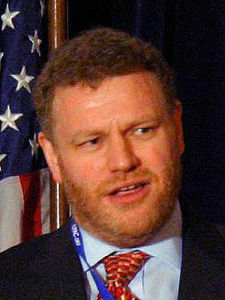 After writing predominantly about the arts, Steyn’s focus shifted to political commentary and moved to the conservative broadsheet The Daily Telegraph which stopped carrying his column in 2006. Since then, he has written for a wide range of publications, including the Jerusalem Post, The Orange County Register, Chicago Sun-Times, National Review, The New York Sun, The Australian, Maclean’s, Irish Times, National Post, The Atlantic Monthly, Western Standard and New Criterion. Steyn’s website provides special commentary and access to many of his columns and other published work. He occasionally posts to the National Review Online group blog, The Corner. Steyn’s books include Broadway Babies Say Goodnight: Musicals Then and Now (a history of the musical theatre) and America Alone: The End of the World as We Know It, a New York Times bestseller. He has also published collections of his columns and his celebrity obituaries and profiles from The Atlantic. Steyn is also a visiting professor at Hillsdale College.